Little Passports offers several different monthly subscription options for children ages 3 to 12 and costing around $15.95 to $18.95 per month when billed monthly with auto-renewal. With the Little Passports introductory kit and monthly boxes to follow, kids learn about the world around them through fun and creative activities. 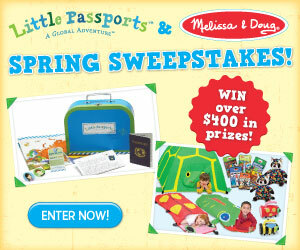 This Little Passports and Melissa and Doug giveaway ends on 3/31/15, so be sure to enter today! Must be 18 years of age; valid to residents of U.S. and Canada (excluding Quebec and Puerto Rico/U.S. territories). See complete rules on the entry form. What Did Your Ancestors Die From?